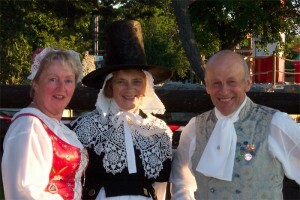 A bit of group history – The group was formed in 1987 by individual members of different Welsh Folk Dance Groups throughout the Principality, with the principle aim of attending and enjoying festivals. “Tipyn o Bopeth” translates to “Bits and pieces” as this is the make up of the group. Over the years we have built strong friendships and links with dancers, musicians and festival organisers, and members of the public that we have met on our travels at both home and abroad. To begin with the group focused on attending the Pan-Celtic festivals, “Yn Chruinnaght” in the Isle of Man; the “Irish Pan-Celtic Festival” which was based in Killarney, but which has since moved to various parts of Eire; the Cornish festival “Lowendar Peran”; and the Breton festival “Lorient”, as well as supporting the more local festivals in Wales. Main activities – Some members of the group meet weekly at the local time-share complex where we give a display of dances interspersed with social dances in which we include the audience. We also dance regularly at local events and locations such as the National Botanic Garden of Wales. We are also asked at times to help teach children in schools about our traditional costume, dance and music. Our costume is made from Welsh flannel woven in the local Woollen Mill in Carmarthenshire. The ladies’ costume consists of a long striped woollen skirt, worn under a plain woollen “Betgwn” [a style of coat]. The darkness of the skirt and betgwn is offset with a white collar and white apron, and on their heads the ladies wear a bonnet and tall Welsh Hat. The men wear black breeches, a waistcoat, a tail coat and hat. The costume is based on the circa 1890 peasant’s style clothing. Membership – Members joining the group were, and still are, expected to participate fully in the festival programme with street dancing, displays, workshops, and wherever possible to take our dance and music to the less fortunate who are confined to hospitals, Residential and Nursing homes. Traditional local events and festival participation – After the formative years of the Pan-Celtic Festivals, which we still support, the group started to spread their wings and take Welsh music and dance abroad. Since the 1990’s we have travelled to Transylvania, Norway, Sweden, France – Brittany, Finland, Estonia, Czech Republic and last year to Russia to take part in International Folk Festivals, and of course across the border into England! We have also started a small “International Day of Dance” locally, which we hold in the National Botanic Garden of Wales. Due to lack of public funding this is limited to two or three overseas groups per year, plus dancers and musicians from across Wales.